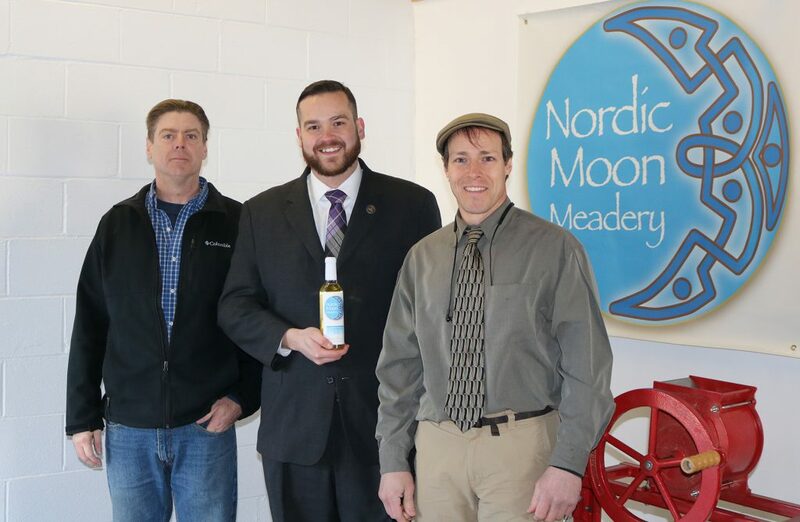 ELLINGTON – State Representative Christopher Davis (R-57) toured the Nordic Moon Meadery on Friday, January 11th with co-owners Rich Gummoe, also a Founding Partner at Ellington’s Connecticut Valley Distillery, LLC, and Kevin West, head mead maker. Mead, also known as honey-wine, is created by fermenting honey and can be mixed with fruits, hops, and spices. The meadery, located on Industrial Drive in Ellington, was founded in 2015. Mead production is a growing industry in Connecticut and New England, alongside farm wineries and craft breweries. The owners shared that existing state laws and regulations have made it difficult to expand their business, introduce new products, and educate the public about mead. For more information about Nordic Moon Meadery or to schedule a visit to their facility, visit their website at www.nordicmoonmeadery.com.